Dr. Patvardhan is a non-invasive cardiologist who cares for patients with heart disease and performs diagnostic procedures such as echocardiography, nuclear stress imaging and heart rhythm monitoring. He is a member of American College of Physicians, American College of Cardiology and the American Society of Echocardiography. 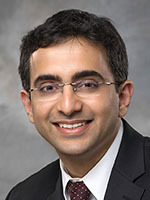 Dr. Patvardhan has published 19 peer-reviewed articles on various aspects of heart disease in prestigious journals including the American Journal of Cardiology and the Journal of the American College of Cardiology. His interests include valvular heart disease, ischemic and non-ischemic cardiomyopathies, preventive cardiology and echocardiography.